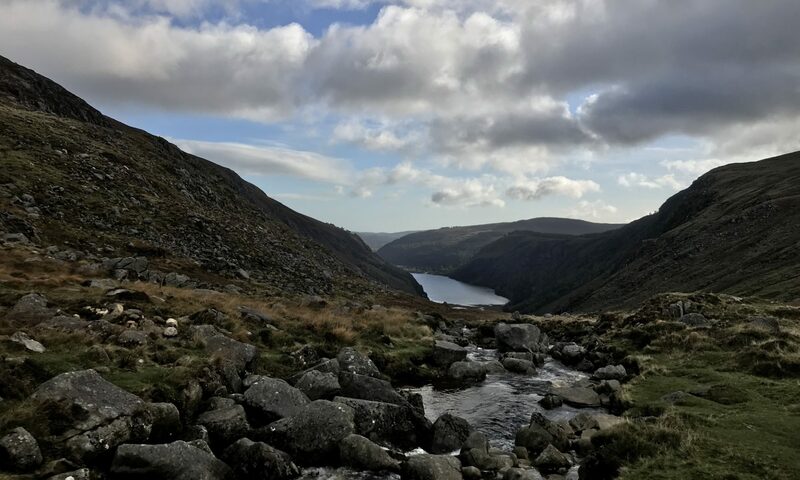 I’m nearing the end of our two-week Celtic pilgrimage, after which our group of 32 will fly back to New York, while I fly on to Dublin to make my way an hour and a half south to Glendalough. There I’ll stay in a hermitage for my annual retreat. It’s been a wonderful pilgrimage, and surprising in so many ways. On the first night of our trip, weary from flying and then driving on to our hotel in Shrewsbury, I talked with our group about the difference between pilgrimage and tourism. A pilgrimage, I told them, is an outward journey that marks an inward one. It’s about seeing places made holy by the devotion of our forebears, yes. But it’s about much more than that. It’s about our own inward journey to the heart, where we find Christ and our own truest self. For generations, people have walked the pilgrim path to give thanks for or to seek healing, to demonstrate penitence, or to mark some major shift in their lives. Traditionally, these pilgrims have walked, and even in our day of air transportation, coaches, and trains, I still think that walking is an essential element of pilgrimage. A coach doesn’t engage the body the way that the feel of the cool air on one’s cheeks or the cobblestones or mud under one’s feet does. The sight of one’s eyes through a window is nothing to the knowledge of the nose and the fingertips and the lips. Pilgrimage is an effort, a demonstration of one’s mettle on the spiritual path, and a way of deepening and confirming devotion to the path. Five years or so ago I made my first pilgrimage, to the Holy Land. It seemed unreasonable to me to go all that way to see sites that I wasn’t even sure were the “real deal.” Was Jesus actually born on the exact spot under the high altar of the Church of the Holy Nativity in Bethlehem, now covered in silver, and barely accessible for the throngs of people elbowing each other out of the way in search a blessing? And why did I need to leave home to travel thousands of miles at great expense, when I knew deep within my heart the Jesus I was seeking? But pilgrimage, as with so many holy things, is not reasonable. All I knew what I had to go, and so I did. That journey did not change the course of my life, but it did unearth new springs of living water within me. I know in my body what countless men and women have known for thousands of years: that tiny piece of land between the Mediterranean and the Jordan is, indeed, holy, if only because countless men and women for thousands of years have deemed it so and have hallowed it with their footsteps, their tears, their hopes, and their love. And in my small way, I have helped to make that land holy. And some of that land’s holiness, and some of those pilgrims’ hopes and tears and love now live on in me. This pilgrimage has had some of that same unreasonableness about it. We have sought to walk in the way of the Celtic saints. The trouble with such an intention is that there is so little left of our Celtic ancestors. Nearly everywhere we visited was ruins. Ruins of monasteries, priories, churches, walls, standing crosses. So many, many ruins. The beautiful thing about those ruins, though, is that they leave so much open to the sky. Shortly after our arrival on Lindisfarne, where St. Aidan built his first monastery in the 7th century, we celebrated Eucharist in the priory ruins. Our group gathered just where the high altar would have been, at the eastern end of the great apse. There we shared scripture and prayer. There we broke bread and passed the cup. Above us, all was sky. In that moment there was no separation between the church and the world or between us and the creation. All was one. Under the blue dome of the sky, framed by the crumbling stone arches erected over 1,000 years ago, we were all one body, made of the one God—stone, flesh, bread, sky. It is no wonder that Celtic spirituality has so emphasized closeness to creation, centered as it is in the world of earth and sky. All over these islands, we have encountered the most tremendous sky scenes. We’ve been battered by the cold rain, tossed by the swells of the ocean, lulled to sleep by the lowing of the cattle. It is my communion with this landscape, more than anything else, that has taken me deeper into the cavern of my longing for Christ and Christ’s longing for me. Yesterday, on Iona, our group gathered for Eucharist in St. Orran’s chapel, the oldest standing structure on the island. It was dark and cool inside. I set the bread and wine on a stool in front of the altar, lit by two small votive lights. We formed a circle around the perimeter of the room, as Matthew led us in a chant: “The earth is full, full of your goodness. The earth is full of you. Your goodness fills the whole earth.” As we sang, a robin flew into the circle and then out again, three times. Each time closer and closer to the bread and wine. On his final approach, he hovered for a few moments over the bread before flying out again. It may seem romantic to say so, but I believe that robin recognized the holiness of those elements and our gathered circle. He certainly blessed us and called forth our blessing, reminding us, as the psalmist does, that the birds of the air and the fish of the sea and the stars in the night sky all sing God’s praises with us. The earth is indeed full, full of God’s goodness, and so are we all. Please help me spread the word. I need your help to reach new readers. If you enjoy my blog, please share it with your friends, on social media, and via word of mouth. Never miss a post. Click on the menu icon in the upper right of this page and enter your e-mail address to receive a notification when I post each week. I will not share your contact information. How wonderful to have you share this experience with all of us. Thank you. What a wonderful experience you are having! Thank you for sharing. See you soon! Thanks, Jane. Absolutely to continue on the path. So beautifully written, Aiden. You made your pilgrimage come alive to those who remain in their homes. Thank you for sharing the experiences of your group with others. It’s such a blessing! Thanks, Mary Alice. I’m happy to be able to share this incredible journey. What a great evocation of the holy lands of the north. God bless you on your retreat. Look forward to seeing you soon! Thanks, Hannah. Looking forward to seeing you for our own pilgrimage of sorts. So glad you’re writing these again!